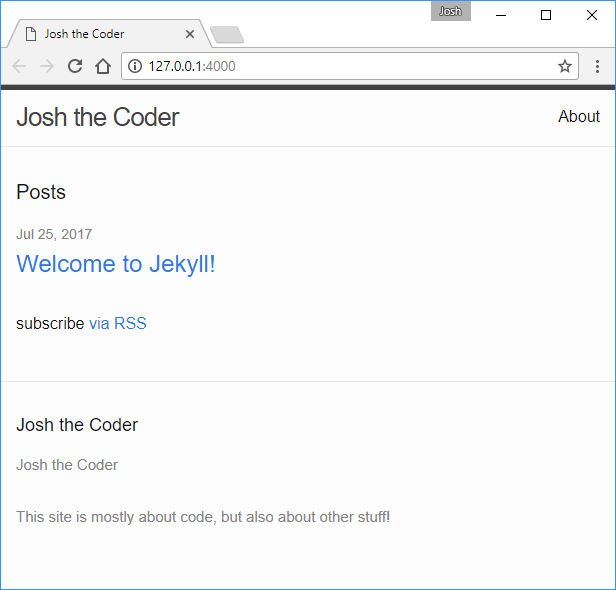 As I ponder what to write on this blog, it occurs to me that the topic of how to set up a blog with Jekyll on Windows is fresh on my mind. So, at the risk of being a bit “meta,” here we go! First of all, what is Jekyll? There you have it. I think I first considered playing around with Jekyll while reading Nick Craver’s blog about optimizing his own blog. One thing I have really enjoyed about working with this technology is the simple deployment (more on that later). So to start, I need to install Jekyll. You’ll notice right away that one of the listed requirements is “GNU/Linux, Unix, or macOS.” Fortunately, with the advent of Windows 10 Anniversary Update, I have access to the Windows Subsystem for Linux (aka Bash on Windows). The Jekyll folks have provided an installation guide (Installation via Bash on Windows 10) that worked perfectly for me, so I will not re-hash it here. Go ahead and install it. I’ll wait. Then I’ll create the new project with the command jekyll new josh-the-coder. The “josh-the-coder” part just tells Jekyll to create the project in a new directory with that name, rather than the current directory. Note: you may need to run this command as root (“sudo jekyll new…”). I did the first time because my non-root account couldn’t actually install the dependencies. Bundler: The dependency tzinfo-data (>= 0) will be unused by any of the platforms Bundler is installing for. Bundler is installing for ruby but the dependency is only for x86-mingw32, x86-mswin32, x64-mingw32, java. To add those platforms to the bundle, run `bundle lock --add-platform x86-mingw32 x86-mswin32 x64-mingw32 java`. Bundler: Fetching version metadata from https://rubygems.org/..
Bundler: Fetching dependency metadata from https://rubygems.org/. Bundler: Bundle complete! 4 Gemfile dependencies, 22 gems now installed. Bundler: Use `bundle info [gemname]` to see where a bundled gem is installed. 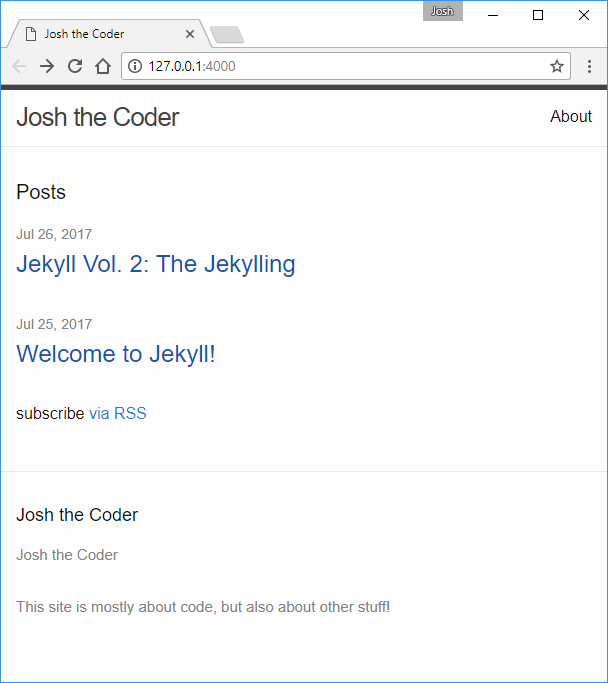 New jekyll site installed in /mnt/c/Code/Blogs/josh-the-coder. Auto-regeneration may not work on some Windows versions. If it does not work, please upgrade Bash on Windows or run Jekyll with --no-watch. You’ll notice there is a lot of filler text here. Most of this is set in the “_config.yml” file in the root of the project. These settings are either self-explanatory, or well-commented. This site is mostly about code, but also about other stuff! To see these changes, I need to stop the serve action (ctrl-c) and run it again, because Jekyll doesn’t reload this configuration file automatically. This site is starting to look pretty good! title:  "Jekyll Vol. 2: The Jekylling"
And it automatically shows up on my home page! Well, it didn’t the first time. Turns out Jekyll is smart enough to hide future-dated posts - in fact, it skips rendering them entirely! Well that’s pretty much it for the basics. One of the huge upsides for Jekyll is the simple deployment. Whenever I build the project (with jekyll build or jekyll serve), a subfolder named “_site” is created inmy project directory. That folder contains everything needed to run the site - all markdown is converted to HTML, all resources from the theme are copied to the appropriate places, etc. So in the end, all I have to do is copy that folder to my web server. I highly recommend perusing the rest of the docs to find out the many other customization and extension points. I know my next stop was how to override theme defaults. Have you used Jekyll? Have another static site generator you like? Think I’m doing all of this wrong? Let me know in the comments!